This indicator is designed for analyzing your positions on 30 financial instruments with the font size of the output information between 8 and 10. If the font size is 11 you will see only 26 instruments and so on: 12-25, 13-24, 14-20. The font size can range from 8 to 14. The main window contains buttons with names of financial instruments and lines where brief information about all open positions is displayed. 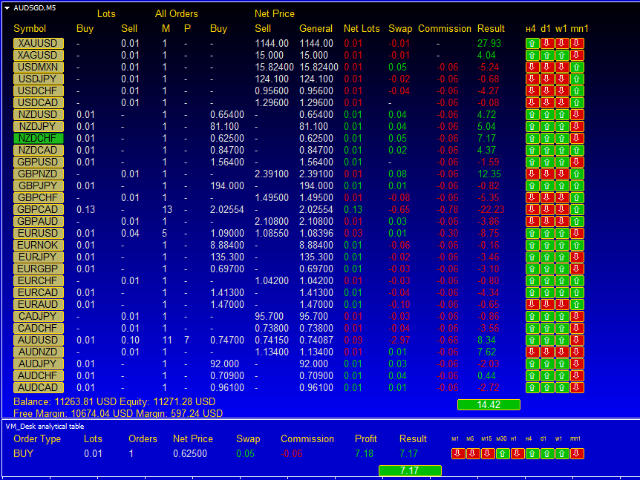 Two columns show the total volumes in lots of positions in each trading direction: BUY and SELL. Next, columns "М" and "Р" in the section "All Orders" correspond to the terms "Number of Market Orders" and "Number of Pending Orders", respectively. Columns with the net prices for each direction and the average price provide the ability to see the net result of the current position in lots, as well as the accrued swaps and commissions, the result in the deposit currency and as a percentage of the account balance. The line ends with labels H4, D1, W1, MN1. The arrow and color indicate the ratio between Open and Close prices. If the Close price exceeds the Open price, the label color corresponds to the color Plus. And color changes to color Minus if the Open price exceeds the Close price. If you click a button with a name of an instrument in the main window, information concerning the selected instrument will be displayed in the lower window. 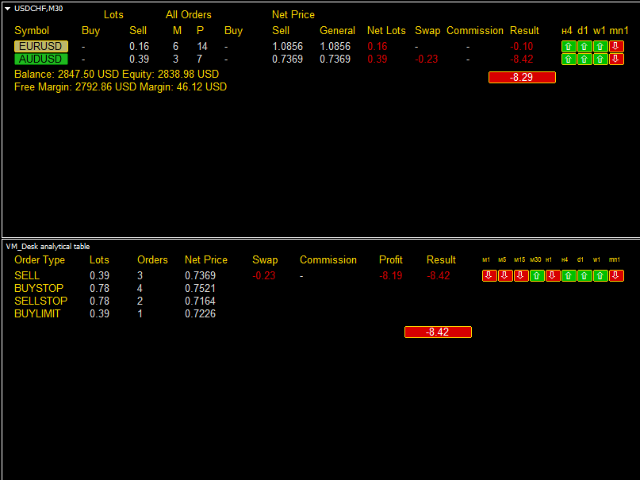 The order type, number of lots, number of orders, breakeven level, swap and commission, profit (loss) and trading result of each order type are displayed in the line. 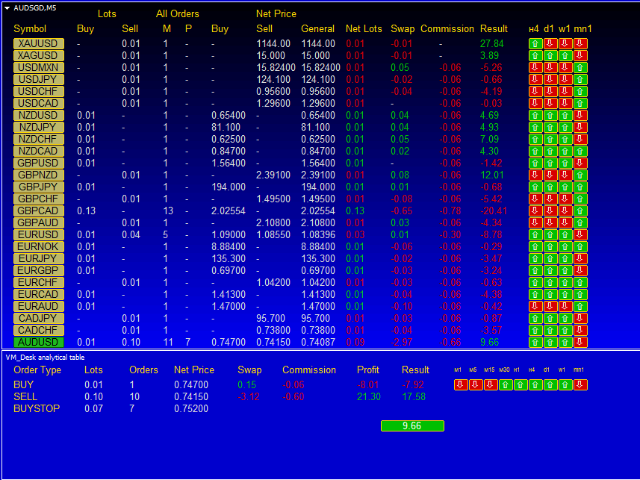 Current trading results are shown at the bottom of the table. 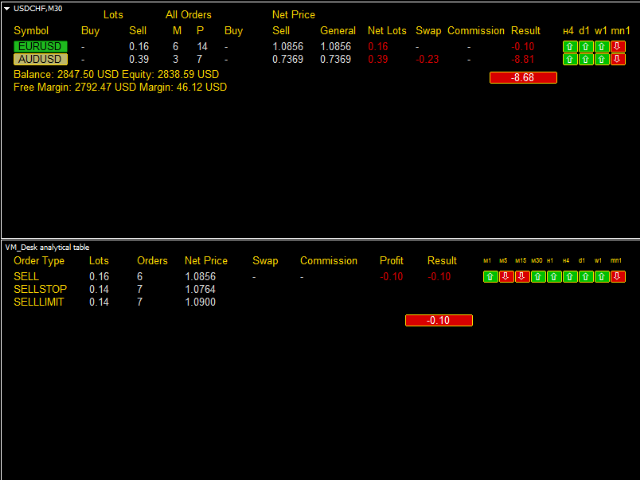 You can also find 9 labels showing available timeframes and position of the current candle close price for each of them. Click the same button again to deactivate it and switch to another instrument. The indicator can be a useful aid for those who trade a huge number of lots and instruments. The indicator does not require any extra settings except for the font size and color of buttons and text. To install the indicator, select a financial instrument you are not going to work with. The indicator will change the appropriate symbol properties for a comfortable operation. Constructive suggestions and feedback are highly appreciated. 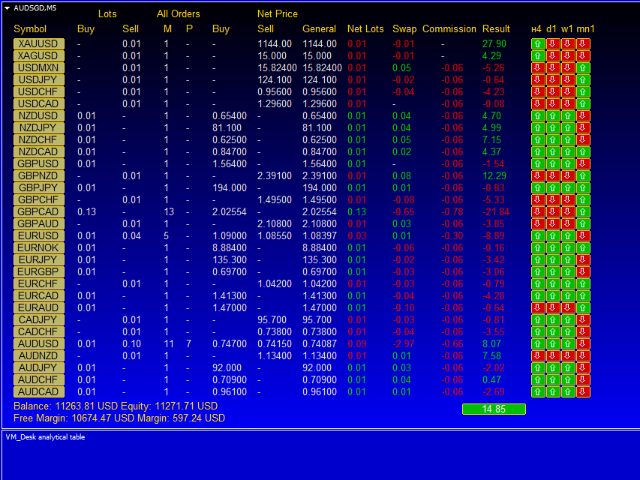 Text color information button - color of text in timeframe labels. v1.8 - adjusted the length of symbol lines for a correct output of information to the lower screen. Virtually any symbols can be displayed in the information area. 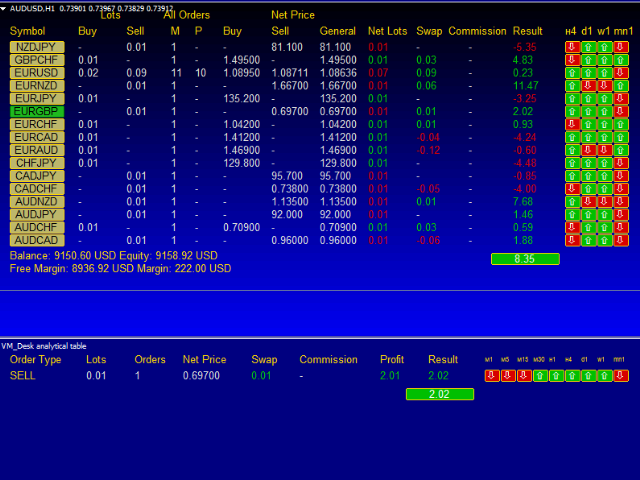 Fixed a possible error in calculation of SELL position results to be displayed on screen. In the "All orders" section column "Market" (M) the number of orders is separated with a slash: the first is the number of "BUY" orders, the second - the number of "SELL" orders. 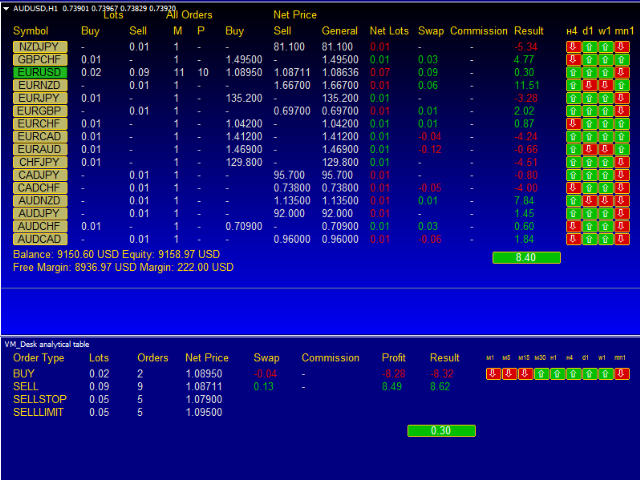 New column "%" - trading result in percent of deposit. Added the ability to change the screen background at your own discretion. Ability to set or not to set default background of the indicator. It should be added that the indicator can be located in any financial instrument window which has no open positions, and where you are not going to open new positions. Uncheck all boxes in common property settings except for "Line", and select "None" in "Grid" and "Line", and MediumBlue in "Background".